THE DIFFERENCE BETWEEN BEARD DYE AND TEMPORARY BEARD COLOR & WHICH SHOULD YOU CHOOSE? Over the past year, VOLT set out on a mission to discover the latest trends in the beard color industry. Throughout our research and interviews conducted at different events and trade shows, we discovered that 95% of men think beard dye is the only beard coloring solution. 4% of the men we interviewed have used hair fibers, and only 1% of men have experimented with alternate beard color options. Additionally, when asked about the difference between temporary beard color and dye, most men generally referred to beard color as dyes. 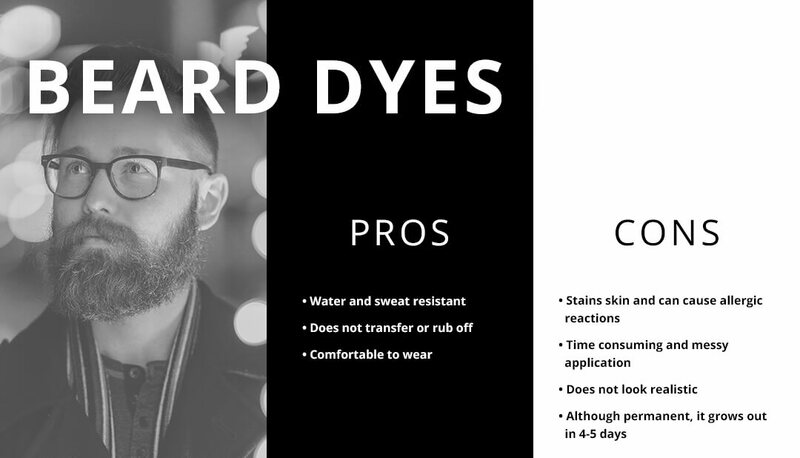 After gathering this feedback, we wanted to share our perspective on beard dyes vs temporary beard colors. In this article, you will learn the difference between the two and how to maximize each product. Our goal is that the next time you are on the lookout for beard color, you will choose the right product that will fit your needs and lifestyle so you can look and feel your best. Beard dyes have been a common form of coloring patchy and grey beards for many years. This is because, until recently, there have been no beard color alternatives available in the consumer-based market that provides similar results. Beard dye products have recently seen advancements in technology. Now more than ever, they provide brush applications that are easier to apply and take less time to develop (such as Just For Men or Bigen). There are some notable advantages to beard dye products. First, the product is permanent or semi-permanent and can last up to two weeks. This is very convenient for men who do not like to re-apply color on a daily basis or after contact with water (though dyes are typically water, sweat and smudge resistant). Beard dyes are also the preferred choice on extra-long beards with large amounts of grey hair or discoloration. This is where other products are not as effective, and beard dyes excel at coloring high-volumes of hair. However, when interviewing men who use beard dye products, we also found that there are quite a few drawbacks to using dyes. Even with the most advanced formulas, it still takes at least 15 minutes for the application (often requiring mixing and gloves) and color development. Additionally, the product requires rinsing off which extends the total application time to over 25-30 minutes. Dyes can also cause allergic reactions to men’s skin and, in many cases, permanent damage is often reported. Therefore, dyes are not recommended for use directly on the skin or on short hair. Although beard dye can last on a beard for two weeks or more, the original root hair color can be seen growing out as soon as four days after the application. This typically can be fixed by re-dying the beard; however, that process can soon end up taking many precious hours out of the month. That’s why men prefer a faster approach to touching up the beard color with products such as Volt Instant Beard Color. Lastly, dyes do not provide a natural appearance as the color is very intense and tends to turn hair into one solid color. Temporary or dye-free beard color differs from a dye because it does not stain (dye) the hair or skin. Instead, it simply surrounds the hair with color. 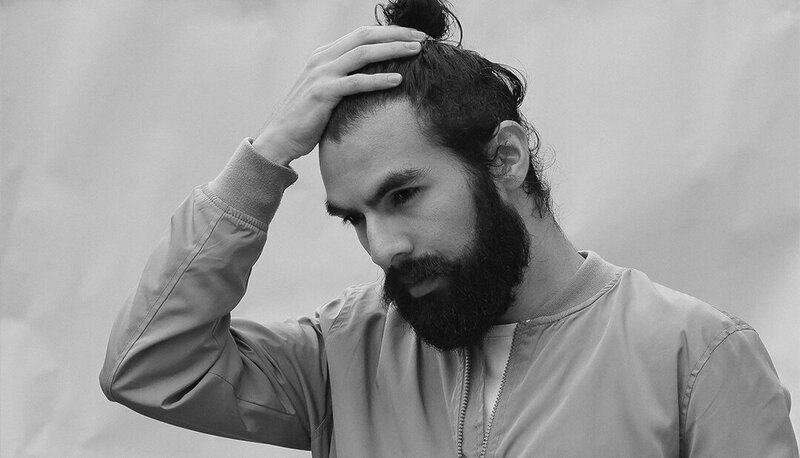 This can actually add volume to the hair and make beards appear fuller. Dye-free beard color, such as Volt Instant Beard Color, dries instantly to a water and sweat-resistant finish that can last 48 hours or more. Unlike beard dyes, instant beard color provides fast application that can take less than a minute. Another remarkable advantage of dye-free beard color is the fact that it can be applied on the skin under hair, making thin and patchy beards look fuller. Additionally, instant beard color can be used along with dye to extend the lifespan of dyes by touching up faded spots or grown out hair roots. The biggest disadvantage of most over the counter temporary beard color products is that they are not water-resistant. They also tend to feel sticky in the beard and rub off easily on surfaces. When selecting a dye-free product, make sure to read reviews and choose the products that provide water, sweat, and transfer resistance. Also look for reviews where customers comment on how the product feels in the beard. We stand firmly behind Volt Instant Beard Color, which combines both attributes, performance and comfort, which you can see and feel. 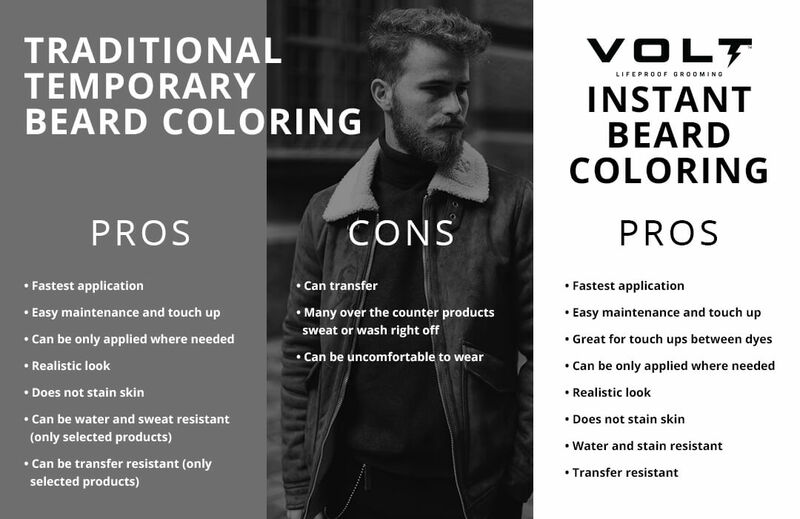 Volt Instant Beard Color was designed to deliver realistic looking beard color that dries instantly, provides a sweat and water-resistant finish, and has a light hold. It’s endorsed by some of the most renowned barbers in the world. Apart from its remarkable performance, Volt is also enriched with Argan Oil and Vitamin A, delivering skin and health benefits that you can feel. The product can last 48 hours or more, and it also brings incredible value with over 35 applications per bottle. Volt Instant Beard Color is the dye-free beard color alternative. It is the perfect solution for grey hair, short hair, patchy beards, thin beards and touching up previously dyed hair. Volt is a lifeproof product that can be used by anyone, anywhere to face every day with confidence. In addition to VOLT Instant Beard Color, there a few other products on the market on the professional level that can provide similar results. These include LiquidHair and Encore alcohol activated palettes made by EBA Performance Makeup. Both products have been successfully used in the film and movie industry where realistic appearance, quick application time, and waterproof finish are desired. It’s time for better beard color. Find your shade of instant beard coloring with VOLT’s new waterproof, sweatproof, and lifeproof Instant Beard Color.